Welcome to the quarterly IAMSE Connects Newsletter. We hope that everyone in the Northern Hemisphere is coming out of the cold and into the excitement of springtime. Speaking of hemispheres, the IAMSE staff and membership committee have been assimilating information on the membership, including profiles of member locations and disciplines for new members. The graphic below is a snapshot of the 2013 new members geographical homes and highlights the international flavor of our organization. For more seasoned members, be sure to check your member profile periodically and update your location, primary discipline and interest areas. Watch future newsletters for more information on characteristics of our membership (and remember to send your news to Rob Carroll at carrollr@ecu.edu). In more meeting news, thanks to all the members who completed the recent survey regarding future annual meeting sites. We received almost 250 total responses, representing over 25% of the membership. The site selection committee and the Board appreciate the input and are listening carefully to your thoughts. The survey results confirmed that geographic location and travel issues (cost and time) remain the main factors influencing decisions to attend or forego the annual meeting and that the meeting experience was an important factor for most of you in deciding to join IAMSE. For future meetings, North America and Europe were the locations that responding members indicated they would be most likely to attend, followed by South/Central America and Australia/New Zealand. We would like to get the meeting to a Pacific Rim location sometime in the future as well. Member News – Recent Kudos! Thomas J. Schmidt, PhD, Professor of Molecular Physiology and Biophysics at the University of Iowa Carver College of Medicine, was chosen to receive a President and Provost Award for Teaching Excellence. The award will be presented in the fall at the 2014 University Faculty and Staff Awards Banquet. Dr Paula J. W. Smith, Academic Facilitator in the Department of Clinical Surgery at the University of Edinburg reports that the University was awarded a Queen's Anniversary Prize for Higher and Further Education at a reception hosted by Her Majesty the Queen, at Buckingham Palace, London. Dr. Smith prepared the winning submission on behalf of the University, which describes the suite of online surgical masters programmes, including the MSc in Surgical Sciences, which offer trainee surgeons a flexible, part-time route to help reinforce theory and engage in intellectual debate. Edward “Pat’ Finnerty, PhD, FNAOME, Professor of Physiology and Pharmacology and past president of IAMSE, is retiring from Des Moines University in June 2014 after over 33 years of academic service. Peter G. Anderson, DVM, PhD, professor and director of Pathology Undergraduate Education at the University of Alabama at Birmingham School of Medicine, has been selected for a Fulbright Specialists project. As part of the award, Anderson will lead faculty development programs and hands-on workshops at the Tzu-Chi University College of Medicine in Taiwan for two weeks. His mission will be to help teaching faculty there improve their curriculum and to develop assessment materials for their medical students. Richard C. Vari, PhD, Associate Dean for Medical Education and Professor of Physiology at the Virginia Tech Carilion School of Medicine received a Faculty Outstanding Teaching Award from the VTCSOM Class of 2015. Susan Ely, PhD, Professor in the Department of Basic Science at the Virginia Tech Carilion School of Medicine received a Faculty Outstanding Teaching and an Outstanding PBL Facilitator Award from the VTCSOM Class of 2015. Janet Hearing, PhD, Associate Professor of Molecular Genetics and Microbiology at Stony Brook University School of Medicine, was the recipient of the 2013 Aesculapius Award for Excellence in Undergraduate Medical Education. Judith Binstock, PhD, Associate Professor of Biochemistry in the Department of Basic Biomedical Sciences at Touro College of Osteopathic Medicine was recognized as Teacher of the Year by the 2012 graduating class. Helena Carvalho, PhD, Assistant Professor in the Department of Basic Sciences at the Virginia Tech Carilion School of Medicine and Research Institute received the "New Investigator Award" from the American Physiological Society Teaching of Physiology Section. N. Kevin Krane, MD, Professor Medicine and Vice Dean for Academic Affairs at Tulane University School of Medicine, received the Gloria P. Walsh Award for Teaching Excellence at the Tulane University School of Medicine. Sana Loue, PhD, Professor and Director in the Department of Epidemiology and Biostatistics, has been appointed the Vice Dean for Faculty Development and Diversity at Case Western Reserve University's School of Medicine. Edward McKee, PhD, accepted the position of Professor and Chair of Foundational Sciences at the newly formed College of Medicine at Central Michigan University. In addition, Dr. McKee was elected Treasurer of the Team-Based Learning Collaborative and Vice-President of the Association of Medical Biochemistry Course Directors. Surapaneni Krishna Mohan, MSc, PhD, Assistant Professor, Department of Biochemistry Saveetha Medical College & Hospital in Thandalam, India, was awarded the “Professional Master of Health Professions Education” from a joint program administered by Maastricht University, The Netherlands and Suez Canal University, Egypt. In addition, Dr. Mohan fulfilled all the requirements and was awarded the Essential Skills in Medical Education (ESME) Certificate in Medical Education. Luke H. Mortensen, PhD, has joined the American Association of Colleges of Osteopathic Medicine (AACOM) as Vice President for Medical Education. Dr. Mortensen was formerly at the Des Moines University College of Osteopathic Medicine. Dean X. Parmelee, MD, Professor of Psychiatry and Pediatrics Associate Dean for Academic Affairs at the Boonshoft School of Medicine of Wright State University, was named the Robert J. Kegerreis Distinguished Professor of Teaching. Dale D. Vandre, PhD, has accepted the position of founding Chair of the Biomedical Sciences Department in the School of Medicine at Western Michigan University. Gabi Waite, PhD, Associate Professor of Cellular and Integrative Physiology at The Indiana University School of Medicine – Terre Haute, is the 2012-2013 research ambassador for the German Academic Exchange Service (DAAD). Amy Wilson–Delfosse, PhD, President of IAMSE and Associate Professor at Case Western Reserve University School of Medicine, received the 2012 Alpha Omega Alpha Robert J. Glaser Distinguished Teacher Award from the Association of America Medical Colleges. This national award recognizes faculty members who have distinguished themselves in medical student education. Peter de Jong would like to introduce two new Associate Editors for IAMSE’s professional journal, Medical Science Educator. Mark A.W. 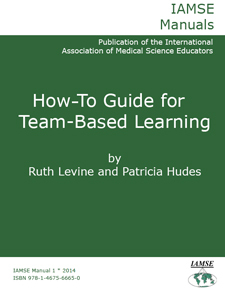 Andrews, The Lake Erie College of Osteopathic Medicine at Seton Hill, Greensburg, PA, USA and Vaughan Kippers, The University of Queensland, St Lucia, Brisbane, Queensland, Australia have been appointed as new Associate Editors for the IAMSE international peer-reviewed journal Medical Science Educator. They both took office starting March 1, 2014. Note that the way for members to access the journal has changed recently. As a member, you have FREE access to the journal. To reach the journal, first login to the IAMSE website. Go to the menu on the left, scroll down to “Members Only” and click on “Member Login”. Now you can use your IAMSE Username and Password. On the next page you can access the full current issues by clicking on: “To view the most current issue, click here”. Note that all archives of JIAMSE (until 2010) are also available on that same webpage. For 2014, Hug a Nurse…Educator! The membership and program committees have been working to increase the interprofessional perspective for this year’s annual meeting. Specifically, we’d love to have a good contingent of our nurse educator colleagues in attendance. Help us out by reaching out to the nurse educators at your institution – send a tweet or email, forward the registration link, or give ‘em an old fashioned phone call and share the invitation to the Nashville meeting.